Free DeliveryMatki Original Radiance Curved Offset Corner Shower EnclosureFrom £927.90 inc.VATRRP: £1237.20 (Save 25%)Size: 1060 x 725mm offset curved corner enclosure, raised or standard dedicated tray options to choose from. Free DeliveryMatki EauZone Plus Sliding Shower Door for RecessFrom £1168.20 inc.VATRRP: £1557.60 (Save 25%)7 widths: 1200, 1300, 1400, 1500, 1600, 1700 and 1800mm. High-lustre polished stainless steel luxury enclosure. 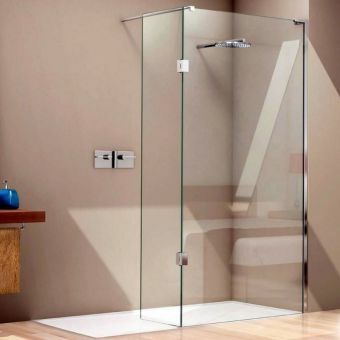 Free DeliveryMatki EauZone Plus Hinged Shower Door for RecessFrom £834.30 inc.VATRRP: £1112.40 (Save 25%)Weighty safety glass, premium quality 10mm thick, with Glass Guard easy clean. 700 to 900mm widths. From single pivot doors for the recessed space, to grandiose walk in wet room areas, Matki Showers provides solutions of the highest quality. Corner installation enclosures are provided in numerous shapes, from the familiar square and rectangular forms to the more eccentric models such as the Matki New Illusion Quintesse. For a truly spectacular finish, the sweeping arcs of the Classica and Curved Corner units create an elegant and evergreen area of the bathroom space. The pure minimalism of Matki Wet Room panels and enclosures offers the user a space of light and air in which to rejuvenate. Whether arranged with a single panel, or augmented with a side panel, these units are of the finest approaches to wetroom creation that can be achieved. Matki Glass Guard Easy Clean is applied to panels throughout the range, creating enclosures that keep their sheen for longer. By actively repelling water, each droplet takes away limescale to avoid the accumulation of grime or dirt to effectively clean the enclosure while you shower. 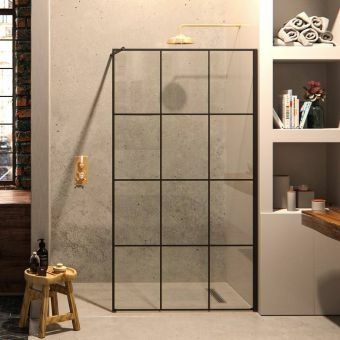 A Matki Shower Enclosure provides a chic, minimalist look to any bathroom - effortlessly fitting with the decor and shape of a space - whilst providing a comforting, consistent warmth in the process from their enclosed nature. 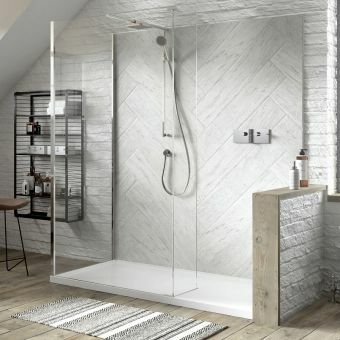 A desirable and enviable bathroom feature, an enclosed shower is at the height of bathroom fashion at the moment - their pared-back elegance fitting nicely with other industrial-leaning design trends. 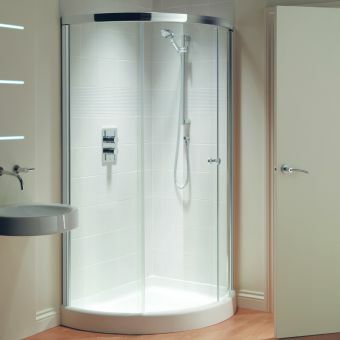 At UK Bathrooms, we stock a wide range of Matki Shower Enclosures that combine their peerless functionality with stunning aesthetics; though they may differ in their styles, the ranges and varieties have consistent quality running through both their design and their usage of materials, which generally consist of striking expanses of tempered glass, as well as metallic frames and fixtures, which combine to create products that are instantly recognisable as the brand's. 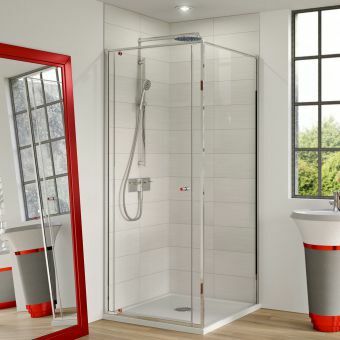 A family run, British enterprise that have been operating since 1971, Matki's expertise and reputation in shower design and manufacture is second to none, and they have been a consistent fixture in the luxury shower market since their inception. Moving with trends and design movements whilst simultaneously staying grounded in their traditional, tried-and-tested methods, Matki remain a particularly innovative and well-regarded company in both shower manufacture and the design world on the whole. 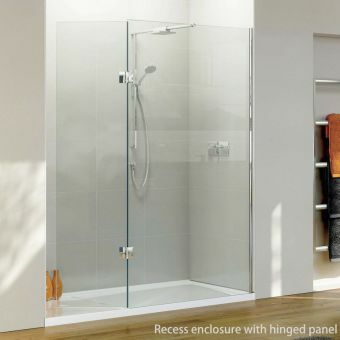 This reputation, experience and skill has given rise to a wide range of products, and it can be difficult to decide which might be right for you: from shower trays and brassware to innovative frameless showers in their Eauzone Plus range. 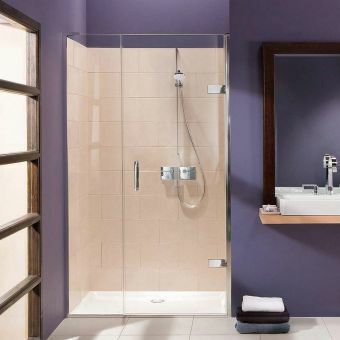 This is the ultimate guide to Matki's Enclosure Showers, which provide a beautiful, subtle embellishment to any bathroom, whilst remaining a noteworthy aesthetic feature itself. 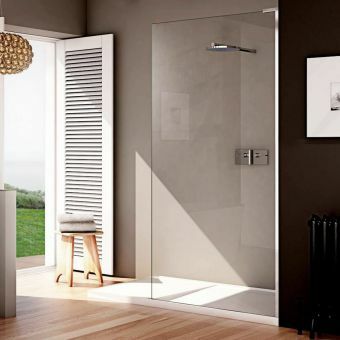 The walk in showers offered by Matki offer superb, stylish and clean aesthetics, with no doors or hinges, merely cleverly placed panes of glass through which those who use it can easily enter and exit. These are excellent choices for those with impaired movement as they minimise the obstructions and potential hazards posed by doors and steps. 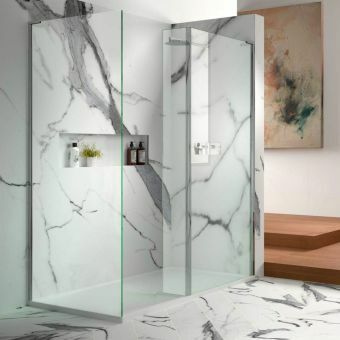 The design of these walk-in showers, though without doors, will not allow for any water to escape the shower area, and they are a strong, beautiful feature for your space. The curvature of a quadrant shower enclosure allows for smooth design lines that are perfect for basing a new bathroom around. Though superbly effective when built into a larger unit, they are commonly placed in the corner of a room to provide an efficient use of space and a look that emphasises the beauty of their surroundings. 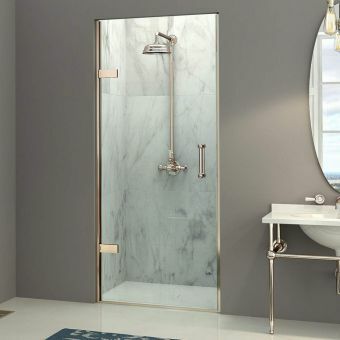 A curved glass door finishes off the look of a quadrant seamlessly, with metallic handles that match the style of the showers themselves, whilst creating a particularly distinctive look. The Matki Radiance Curved Corner Shower Enclosure provides a strong example of how a quadrant shower can fit the design and aesthetic of your bathroom. Pivot doors, like their hinged counterparts, are better suited to larger spaces, but their user-friendly, clever design works wonders in a wide range of spaces. A pivot shower door allows you to open it from either the right or left-hand side, and the convenience is as alluring as their look. Perfect for wall recesses, they make for a private, personal space that speaks of luxury and comfort simultaneously, and Matki's wide range of specifications and sizes allow their pivot door options to excel even further. A superb, graceful and beautiful option for a diverse range of bathroom requirements. 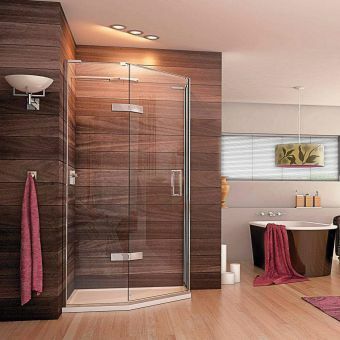 Sliding shower enclosures are in many respects an excellent combination of the varieties already discussed here, blending the seamless elegance of the walk-ins with the practicality of the hinged and pivot doors. 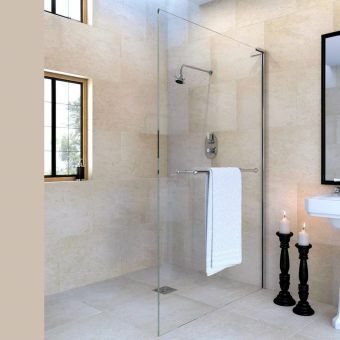 Sliding gracefully along their tracks, the sliding shower doors of the shower provide the choice design features that one hopes for in a new bathroom, allowing for a far more satisfactory shower as a result. Elegant, practical and versatile, they are perfect for larger spaces and chic, modern interiors. The designers at Matki link their different products through the stylistic themes of their different ranges. Each of them uses separate design features and aesthetics, but they are all bound by a unique and firm grasp of on-trend, contemporary bathroom fashion, as well as the functionality that they need to work seamlessly in your home. The New Radiance continues the work of Matki's earlier Radiance collection in providing a sleek, modern design that provides sanctuary from the frantic pace of life. Sliding fixtures, tempered glass and chrome framing are characteristic of the New Radiance collection, and an emphasis on smooth, discreet door functions is also prevalent. UK Bathrooms stock items from this collection with pivot, bi-fold and curved doors, each of which is just as smoothly functional and elegantly crafted as the last. These showers make smaller spaces feel far more open, and breathe new life into a bathroom in the process. The robust yet delicate design of the Colonade range extends across a range of Matki's products, encompassing bi-fold, pivot, sliding and curved varieties, and fitting beautifully into each. An emphasis is placed upon bold, rectangular frames that border the shower beautifully, allowing them to become an alluring and noticeable, yet complementary and subtle, feature of your bathroom. Sleek, metal fixtures finish off the designs beautifully, providing a dynamic flow to any room thanks to the reliable consistency of the Colonade's aesthetic. 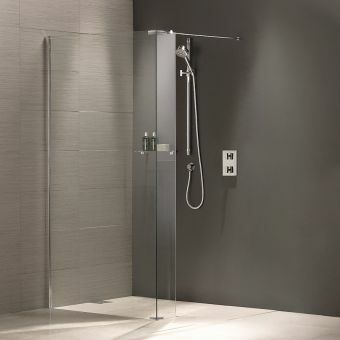 Matki's boutique collection focusses on walk-in shower solutions and represents the more modern and eye-catching styles in contemporary shower design. A concept that is based around the idea of having no doors, the clever placement and usage of glass allows for no leakage whatsoever, and they are perfect for installation in corners, recesses and three-walled configurations in a wide range of spaces. 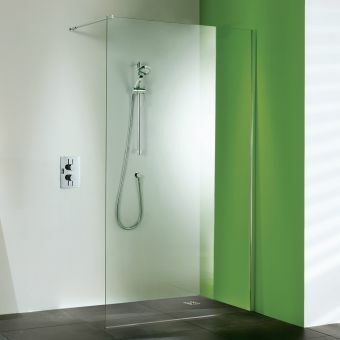 With a construction made almost entirely of glass, the collection's shower-tray integration is noteworthy not only for its unique style but for its ability to dispense with the need for any silicon sealant. With optional brassware available that incorporates and implements leading technology in water flow and temperature regulation, the Boutique collection is outstanding in both its innovative nature and its aesthetic appeal, providing an air of modern indulgence to a home in its intelligent re-thinking of the wet room. These are showers that stand out whilst blending in, making them the perfect choice for anyone who wishes to take elevate their bathroom to a higher level. With an emphasis on frameless design and clever, sleek wall channelling, the New Illusion range's floor and glass meetings are well designed and particularly effective, providing a clean, calm aesthetic, whilst adding to the unit's strength and dispensing with the need for sealant, similarly so to the Boutique range. An open, spacious feel is brought about by its glass construction, with no compromises on durability or function. A wide entrance, with doors boasting non-slip hinges, allows this sense of space to be achieved even upon entering the shower, providing an atmospheric space that is at once calming and invigorating. Our stock of the New Illusion range includes both hinged and curved variations, allowing you to tailor your shower to your space for the ultimate retreat from the busy world outside. Quality components and the finest materials with a twist of the unexpected go together to create the Matki-ONE range. Its sleek elegant frames outline its almost frameless appearance and are supplied in silver chrome as standard but can also be ordered in bespoke colours black, white or architectural bronze. The overhead sliding runners are whisper quiet and glide atop a polished stainless steel frame. The understated elegance of this modern masterpiece can be further enhanced with detail colours for door handles and bracing bars with coloured discs adding a touch if colour providing a discreet, universal appeal. Each and every one of the Matki showers in our UK Bathrooms collection is a worthy investment, and we have designs to meet all space and all budgets. Generally speaking, pivot door showers are the least expensive, as well as bi-fold door showers, as these are often smaller in size, though their design - as always - ensures that the showers feel airy and spacious. 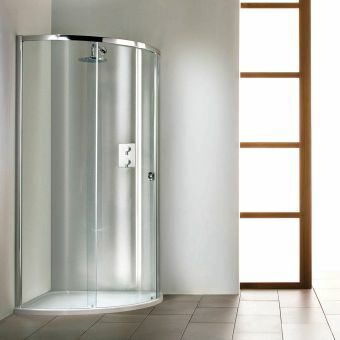 Curved door Matki showers generally occupy the mid-range of the products in terms of price, with value added for the curved features which necessitate corner use, as well a greater intricacy of design. 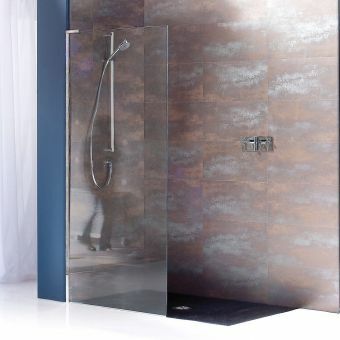 Our selection of walk-in showers from the Boutique range is amongst the most expensive as these showers are largest, require a greater level of expertise to install and include a range of innovative features for a totally immersive shower experience. Each feature in the Matki range is a hard-wearing and reliable option when it comes to choosing your new shower, and the less expensive models by no means render them inferior. Every Matki shower is designed with the same consideration and attention to detail, whatever size or room they are designed for. If you would like more advice, contact us at UK Bathrooms today.